Visa Lighting began collaborating with Vital Vio late last year. Vital Vio engineers the disinfecting LED technology. 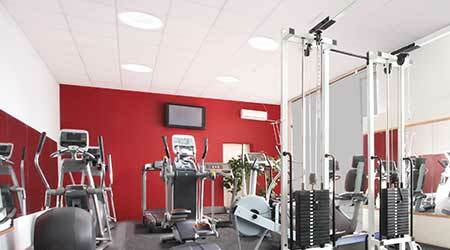 The germ-killing light fixtures can continuously disinfect indoor surfaces. Violet wavelengths of visible light in the 400-450 nm range cause bacterial cell death but have no known harmful effect on humans. White Light Disinfection mode utilizes a patented single-diode light source that precisely blends and balances enhanced output in the germicidal 400-450nm range with other wavelengths in the visual light spectrum. This produces pure 4000K-4100K white light, which provides a disinfecting benefit without a color shift in the visual appearance of the luminaire or its light output. Eco Mode, an alternative to White Light Disinfection mode, uses a precisely-tuned source including high output in the 400-450nm range, producing a soft, violet-colored light output that provides maximum visible-light disinfecting capability. This acts as a disinfection maintenance mode for when illumination is not needed in a room. Available in five disinfecting luminaires, including Symmetry. A round, recessed ceiling luminaire with a patented concave lens and multiple source options including Vital Vio’s continuous disinfection technology, Symmetry fits in 2x2 grids.